May buy 1 for yourself and 3 additional as gifts. Valid only for option purchased. Must be redeemed online. Shipping is an additional $3.99 and will be paid separate at checkout on merchant site. Fulfillment is currently 7-10 days. Expires 4 months after purchase. See the terms that apply to all deals. 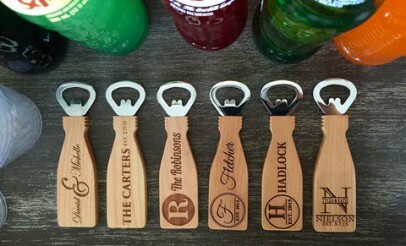 These beautiful bottle openers make the perfect gift! They are made from 100% maple and are very sturdy. They have six different designs for you to choose from: Robinson, Carter, Fletcher, Hadlock, Nielson, or David & Michelle. American Laser Crafts takes everyday household items and makes them unique and special by engraving them with custom designs. Their most popular items to engrave are cutting boards, rolling pins, kitchen accessories, plates, hot pads and coasters; as well as, frames, home accessories, and gifts. American Laser Products products are perfect for a memorable, personalized gift!